How did Communist parties handle issues of internal discipline and democracy in Lenin’s time? An intense discussion now under way within the British Socialist Workers’ Party (SWP) raises issues related to the nature of internal democracy in the Communist International (Comintern) during 1919–23, the period of its first four congresses. Like most Marxist groups today, the British SWP looks to the Bolshevik Party under Lenin as a guiding example of revolutionary party-building, and much of the discussion deals with this comparison. However, in seeking a model for a revolutionary party, it is also worth looking at the Communist parties in Lenin’s time outside Russia, which functioned in circumstances much closer to what we face today than those of tsarist Russia. In the course of editing and translating into English several books of documents on Communist history in Lenin’s time, I have studied debates among Communist party delegates at many international events. Here is my reading of what this record tells us regarding Comintern organisational norms. Factions and tendencies: There was no ban on factions in the Comintern. During its early years, its major parties were factionally divided most of the time. Discussions: Disagreements within Communist parties were routinely argued out before the working class in the parties’ publications. Executive Unity: Members of the Comintern Executive and its Small Bureau in Moscow frequently carried their disagreements to world congresses, as did members of national leaderships. Leadership: Leaderships in the Comintern and its parties were elected, and where slates were presented, these were subject to amendment. A comment is in order on each of these points. Factions: In the Bolshevik-Comintern tradition, factions were temporary formations, constituted around immediate issues. When an issue was resolved, factions that had been formed around it normally dispersed. For example, during the third Comintern congress in 1921, two factions in the German party, which seemed on the point of split, came together around a common political statement. Part of their agreement was that the factions would dissolve. They did so, but new factions quickly formed – around new issues and with new alignments. Discussion: The Comintern took for granted that internal discussion should be shared with workers outside the party by conducting it in party newspapers. Sometimes, Communist publications presented a minority point of view; a prominent example was Kommunismus, the ultra-left organ published 1920-21. Especially following the expulsion of German Marxist Paul Levi in 1921, the Comintern frowned on factional publications outside party control. However, each party had a great many publications, each with its own editorial structure, and this encouraged a diversity of opinions. Executive Unity: In the Third World Congress (1921), the conflict between ultra-leftist and united front-oriented currents in Germany and other Central European countries divided the Bolshevik leaders and the Comintern Executive’s Small Bureau. In the end, the congress managed to adopt resolutions by general agreement, but conflict continued to the end of the congress and after. Leadership: Initially, members of the Comintern Executive were delegated by its national parties. In 1922, for the first time, members of the Executive were elected by the congress as a whole. A nomination commission, made up of delegates chosen by the various parties, recommended a slate of candidates. When it was presented to the congress, amendments to change the slate’s composition were made and voted on. Election procedures in the parties varied, and candidates were often proposed collectively in slates. As far as I can see, such slates were always subject to amendment and approval by vote by convention delegates. I have seen little mention of these four issues in my reading of the early Comintern debates. Attention to organizational norms had a different focus, which flowed from the origin and character of the Comintern’s national sections. Parties in the imperialist countries had tens or hundreds of thousands of members. They also had a broad periphery of sympathizers, many of whom worked with party members on specific issues, such as aid to Soviet Russia, the emancipation of women, or opposition to colonialism. The party functioned in close contact with a broad layer of revolutionary-minded workers. The party and its periphery exerted influence throughout the working class. The Communist parties of Lenin’s time included a wide spectrum of revolutionary socialist traditions. Party members were diverse in background, coming from Social Democratic, syndicalist, or revolutionary-nationalist origins. The International’s internal debates focused on issues of tactics and strategy and the significance of its policies for the broader mass of workers, on whom their actions had a major impact. Debates in its parties typically reflected social differentiation and contrasting opinions within the working class as a whole. Two axes of dissension within the working class dominated the Comintern’s internal life in the 1919–23 period. First, workers steeped in the pre-war traditions of Social Democracy were challenged by a young, revolutionary generation thrown forward by the war. Then, as the post-war revolutionary wave began to decline, workers impatient to strike a decisive blow against capitalist power came into disagreement with those who had grown cautious and were concerned with the need for unity in action. Such disharmony in the working class made it harder to grapple with the obstacle posed by reformist Social Democratic parties and to achieve unity against the capitalist foe. Disagreements along these axes dominated the Comintern’s inner life during its first years. Factions sprang up in member parties reflecting the moods of more impatient or more cautious layers of the working class. On the whole, the Comintern had reasonable success in coping with such disputes, but they would arise again, driven by events in the struggle and pressure from the working class. As a result, internal debates were marked by shifting alliances and frequent changes of leadership. The German Communist Party, for example, reorganized its leadership four times in 1921 and 1922. The debates on tactics and strategy also served to define the breadth of the Comintern – that is, the line dividing the range of currents included in its ranks from reformists on one side and incurable ultra-leftists on the other. Where to draw that line was the main organizational issue in Comintern life. In 1920–21, as the postwar revolutionary wave began to flag, a surge of impatience among revolutionary-minded workers led to forces attracted to ultra-leftism gaining dominance in some central European parties and even – during a crucial period – in the Comintern Executive. But this urge for a showdown was out of step with the class relationship of forces. As a result, in 1921, the Comintern suffered a grievous setback in Germany, which led to damaging splits. During that year, however, the Comintern moved to rectify its course through adoption of the united front policy, which engaged parties in a campaign for working class unity in action. The Comintern and its parties sought to function according to the norms of “democratic centralism.” This term was understood to mean proletarian democracy in taking decisions and choosing leaders, combined with unity in carrying out a decided course of action. Marxists have much the same concept today. But in the early Comintern, the focus was different: its chief concern was grappling with bureaucratism and electoralism. The main constituent units of Comintern parties outside Russia came out of the old Social Democratic movement. These component parties had shed their reformist wings but still preserved much of the old parties’ structures and habits. The parties from which they came had devoted their energy mainly to electoral campaigning and associated educational work. They were led by a bureaucratic layer of functionaries rooted above all in the parliamentary fraction, the journalistic apparatus, and allied trade union leaderships. The Comintern’s democratic centralism sought to break the grip of bureaucratism. It aimed to bring parliamentary, journalistic, and trade union work under party control; to unify leadership and ranks into a homogenous movement; and to equip the party to intervene in mass struggles. Meanwhile, the need for discipline was posed above all – just as it is today – in clashes between the working class and its capitalist opponents. When workers’ in Italy occupied their factories in September 1920, the Italian section of the Comintern did not carry its recommendations for the struggle into the unions, leaving the top union officials – members of the Comintern – unchallenged in their betrayal of the struggle. Meanwhile, in Germany, advanced revolutionary contingents repeatedly launched armed resistance to capitalist oppression in isolation from broader working-class forces. Such episodes led to defeats in January 1919, March 1920, and March 1921, and – each time – the Communist forces were divided. The Third Comintern Congress, in 1921, took up both these dangers in France. The French Communist Youth were chastised for having advocated that French workers individually refuse to report for duty during a crisis in French-German government relations. At the same time, a Communist Party leader, Marcel Cachin, was rebuked for having suggested in parliament that there was something positive in France’s imperialist alliance with Britain. Appeals to discipline were not a sufficient response to these strains. Lenin’s Comintern sought to counter such divisive tendencies by development of strategy and of united front policy, one aspect of which was the need for diverse working class forces to maintain discipline in united actions. Such problems are not all that different from those we face today when, for example, a mass anti-cutbacks demonstration comes under threat from Black Bloc disruption on one side and the hesitations of trade-union officials on the other. The need for discipline in action is imposed not by party statutes but by the universally understood requirements of working class struggle in every sphere. In the imperialist countries, today’s Marxist groups are orders of magnitude smaller than those of Lenin’s time. They function in a context where bourgeois democracy is more deeply rooted, revolution appears more distant, and the working class is more heterogeneous and diversified in its concerns. For all these reasons, one might expect Marxist groups today to be more open, flexible, and inclusive than in the years following the Russian revolution. In fact, the opposite is the case. It is important here to avoid caricature and abusive generalization. Some Marxist groups show promise and have played decisive roles in building mass movements and in innovative party building experiments. Yet there is a model around which the majority of these groups cluster, a pattern that we will call “small-group Marxism.” It contrasts sharply with that of the Lenin-era Comintern. Typically, the membership of each group is limited to a single strand of Marxist political continuity. Groups tend to splinter over time. The competing groups increase in number, while engaging in a war of each against all. The links of such groups with the working class are not strong. Divisions in these groups often flow from their inner dynamic rather than from class-struggle challenges. Internal democracy is often less developed than in the early Comintern. Programmatic differences between the groups are not great. Each rival current is defined chiefly by its political culture and traditions. This allegiance gives such groups a conservative cast, making it hard for them to learn from the changing struggle, correct their course, and unite with other currents. Groups show little capacity to resolve differences harmoniously through experience. Leaderships are often isolated from effective control and tend to be self-perpetuating, unless the key players have a falling out. Discipline aims less at unity against the class enemy and more at keeping members in line and regulating what they say and do. Success is defined not so much by victories of the class as by the group’s ability to grow, accumulate resources, and get the better of its Marxist competitors. These characteristics can best be explained as an evolutionary adaptation to conditions of small-group existence in difficult political conditions. Many groups resist this model with some success, but its pressure bears down on them all. Certainly, conditions have changed vastly since Lenin’s time, and the early Comintern’s record in building revolutionary parties was uneven and flawed. Yet although Lenin’s Comintern does not provide a textbook, it should serve to stimulate our imagination. Today’s Marxist organisations will not surmount the limits of small-group existence and contribute significantly to building a revolutionary movement unless they overcome the limitations of the small-group Marxist mindset and begin to acquire the virtues of Communist parties of Lenin’s time. Explanation of photo: Translation was the lifeblood of discussion in the Communist International. 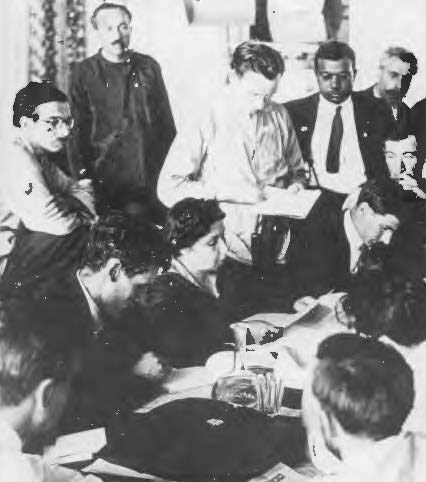 Here, Angelica Balabanoff is translating for a group of English-speaking delegates at the Second Congress (1920). Behind her with arms folded is Louis Fraina (U.S.); behind her, writing, is John Murphy (UK); to his left is Abani Mukherji (India); left of Mukherji is John Quelch (UK); underneath them, writing, is William McLaine (UK). John Riddell is the author of seven documentary volumes on revolutionary history in Lenin’s time. For information on these books and his other writings, go to https://johnriddell.wordpress.com.
. For the position of the SWP leadership majority, see “Is Leninism Finished,” by Alex Callinicos. For the SWP opposition’s response, see “Is Zinovievism finished? A reply to Alex Callinicos” and other documents at International Socialism.
. Lenin expressed his appraisal of Kommunismus tactfully but firmly: “This excellent journal, which is published in Vienna under the above title, contains a great deal of highly interesting material on the growth of the communist movement in Austria, Poland and other countries, together with a chronicle of the international movement, and articles on Hungary and Germany, on general tasks and tactics, etc. A shortcoming that strikes the eye even at a cursory examination cannot, however, be disregarded—the indubitable symptoms of the ‘infantile disorder of Left-wing Communism’ that has affected the journal, a subject on which I have written a short pamphlet that has just appeared in Petrograd.” See V.I. Lenin, Collected Works, Moscow: Progress Publishers, 1960–71, vol. 31, pp. 165–7.
. John Riddell, Toward the United Front: Proceedings of the Fourth Congress of the Communist International, 1922, Chicago: Haymarket Books, 2012, pp. 1104–9.
. In dealing with these issues, most historians of the Comintern stress the effect of shifts in Soviet Russian foreign policy, intervention by the Bolshevik leadership, and the personal role of Zinoviev, the Comintern’s president. These factors – especially Soviet foreign policy – were also cited at the time by the Comintern’s opponents, both left and right. In my opinion, their influence has been exaggerated.
. The translation is from the manuscript of my forthcoming edition of the Third Congress. The resolution’s full text is available at Marxists.org. For Lenin’s subsequent reservations on this resolution, see Toward the United Front, pp. 303–5.
. Toward the United Front, p. 44.
. The Comintern Executive’s discussion of these issues, available in the Russian archive RGASPI under reference number 495/1/37, will be included in the forthcoming edition of the Third Congress proceedings. Very interesting – a salutary lesson! A natural translator, can’t help himself. Meanwhile: Your last three paragraphs are as succinct and sublime a summary of the dead end of much ultra hard, far left organizing as one language is probably capable of. Much to think about. About the current situation on the Marxist left. I’d say that most of the Marxist groups that fit your “small group Marxism” label are ultra-left. Some reject the united front model altogether. Others support the united front model in the advanced capitalist countries, but fail to adopt it with respect to the global south, in particular failing to engage in an anti-imperialist united front with the governments in Venezuela, Bolivia, and Ecuador (the record of “small group Marxism” with respect to Cuba is more mixed). Not to mention the Stalinist and Maoist groupings, which are a different problem altogether. The other point of relevance is that much of the Marxist left today is not involved in any formal Marxist formation at all. These folks are involved either in issue based coalitions and campaigns, or are embedded in their country’s respective social democratic party, or both. Most of those that I have contact with here in Vancouver support the concept of a united front, and most will admit the need for a revolutionary regroupment of some sort if pushed hard enough. However, I find that most will also advocate a vote for the NDP, and are loathe to take any action that will do anything, however slight, to weaken the electability of the NDP. The other thing I notice here in Vancouver among some Marxists is an extreme version of localism. Marxists who devote all of their energies to Vancouver civic politics and to issues around gentrification, housing, and homelessness. There’s even a handfull of Vancouver Marxists connected to an online publication called The Mainlander who have argued for a political version of the “100 mile diet”. In China, there was some bullying by CMT agents even while Lenin was alive. I mean Maring (Sneevliet), of course. Others bullied too. Dear friends, what a cool blog I found. I have a question when do you people think that we might see US citizens electing a socialist workers party into the government, or being willing to support a marxist socialist party and be willing to be more political. Because I find that most americans hate politics, and live a private life totally divorced from government affairs. Because they are not able to connect the dots between political systems and the prices of food, gas and their personal lives.